Everything we do is for agriculture, and it is all thanks to the amazing group who volunteer their time and effort to plan initiatives and events across the province! We asked each of our team members why they were proud to be a Woman in Ag, so take some time and get to know a little more about each one of us! The agriculture industry continues to grow, develop and change at a rapid rate. The many women I have learned from and been inspiried by along the way, have allowed me to grow, develop and change with it. I find it fascinating that so many of us come from different backgrounds, professions and/or life experiences, yet we all find common ground in the desire to continue to feed the world and nuture the land. I have met so many amazing women involved in different levels of agriculture across Saskatchewan, and I am proud to be part of a group who can help connect these women, and continue to strengthen our wonderful industry. "Working hard for something we don't care about is called stress; working hard for something we love is called passion"
I am so proud and honoured to work in the agriculture industry. I have spent my professional life in Saskatchewan and am always amazed at how progressive, challenging and welcoming this industry is. Working with farmers and others in this industry is something I consider myself lucky to do and I couldn't imagine working anywhere else. The group of women in this organization are people I have tremendous respect for and admire each of them for the impact they have on agriculture. I look forward to working with them and learning from them! I live in Tisdale, Sk with my dog (Cheeko), cat (Flint) and horse (Buddy) where I work as a technical agronomist for Monsanto DEKALB. I am proud to be involved in Women in Ag because there are so many great role models involved in the group as well that share the same interests I do and can help guide me along my own agricultural path. This group brings women together and empowers them to become more passionate and vocal about women in agriculture. I grew up on a small livestock farm, where we operate a meat-shop as a value-added business. I'm currently pursuing a degree in Agribusiness. Women in Ag is a group of passionate, creative, and intelligent women that inspire me daily. Our mission to "support, connect, and empower" is truly carried out every single day. I'm excited for what the future of agriculture has to hold, and how I can be a part of it. People say that the future belongs to those still willing to get their hands dirty, and I can't wait to get some dirt under my fingernails. I currently live near Kipling, SK where I work as a Crop Production Advisor with Nutrien Ag Solutions Canada and help out on my parent’s grain farm. After going to the U of S to complete my BSA in Agronomy, I knew I wanted to return to the farm to start taking a more active role in the operation. Being involved in the Women in Ag organization has allowed me to expand my network, meet some incredible people and be a part of a group that is helping women support women no matter what sector of the industry they work in. I look forward to seeing where the industry takes us and how this group expands in the years to come! I always knew I wanted my future to involve agriculture. I grew up on a mixed farm outside of Pilger, SK and kept busy training and showing horses. I have been involved with multiple organizations in the past and I am very excited to join the Women in Ag. The group has a network of great women and I look forward to hearing and learning from them all. I am proud to say I am a woman in ag and hopefully I can add to the growth and success of the group! I am proud of my agriculture background, and I have always wanted to continue my involvement with agriculture in some capacity. 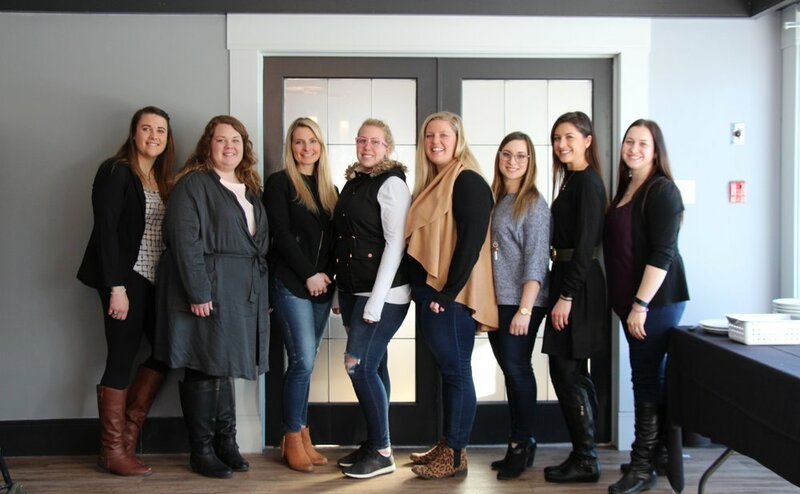 Women in Ag is a great group that supports and connects those across the industry. Having the opportunity to work alongside other passionate women involved in agriculture in different capacities has proved enlightening. Working in corporate agriculture, I am proud to see women hold influential positions both on and off the ranch. There has never been a better time to be a women working in Ag. I grew up with strong female role models on my family farm in Ontario and though I live/work far from my family farm operation, I am proud to continue to contribute to the Canadian agriculture industry that ties me to my roots. Women in Ag's mission of empowering and connecting women strongly aligns with my own values and it is a priviledge to volunteer alongside so many incredible women involved in Women in Ag to do just that. Shayla grew up on a grain farm outside of Edenwold, where her parents still farm today. She attended Williston State College in North Dakota to play NJCAA volleyball and study agriculture economics before transferring to the College of Agriculture and Bioresources at the University of Saskatchewan. There, Shayla was a member of the Canadian Agri-Marketing Association Student Chapter, a Student Ambassador for the Saskatchewan Institute of Agrologists, and president of the Agricultural Students’ Association in her final year. Her summer work experience has been with Bayer and DuPont. Shayla holds a Bachelor of Science in Agribusiness and is currently employed as the thinkAG Manager with Agriculture in the Classroom Canada, where she promotes agricultural career exploration and development. Prior to this role, Shayla worked for the provincial government as a Provincial Agriculture Awareness Specialist. Shayla lives near St. Walburg, Saskatchewan where she farms with her boyfriend, Nick Wourms, and his family on a mixed grain and cattle operation. She is very passionate about educating Canadian youth on the importance of agriculture and all it offers to our province, country and world. She feels that Saskatchewan Women in Ag plays a vital role in ensuring women have their voice heard on critical agricultural issues, and that their influence is utilized to build public trust in the industry. Agriculture has always been apart of my life. I grew up on a grain farm newar Wilkie, SK, and currerntly live in London, ON learning about agriculture in Eastern Canada. Here I work for the Climate Corporation as a Climate Business Manager. I love being surrounded by positive people who are passoinate about what they are doing which is why I joined the Women In Ag team. It's a great way to stay connected with different people who work in different parts of the industry who I wouldn't have the chance to connect with otherwise. Amy was raised and involved on a mixed family farm consisting of cattle and grain near Pike Lake, Sask. In 2003 she received her Diploma for the Crop Advisor program from Olds College. Her experiences include being a Crop Scout for Cargill Ag Horizons, Location Assistant at Pioneer Grain, and G-Mac’s Ag Team as a Sales Agronomist. Currently Amy works with Blair’s Family of Companies as the Director of AgIntelligence. Amy works with her team of Agronomist to deliver agronomy services to help maximize customers farming goals. Amy enjoys brining new ideas to her team and working in an industry that is ever changing. She also lives on a mixed farm near Hanley, Sask with her husband and two boys were they are actively involved in the family farm. Farming has always been a huge part of Amy’s life and she enjoys watching her boys grow up on the century family farm. Shelley is a proud AGvocate! Her efforts toward improving the public perception of agriculture have seen the development and delivery of agriculture awareness, youth leadership, career promotion, and training programs under Growing Forward 2. A couple of celebrated successes include the establishment of Farm & Food Care Saskatchewan, targeting awareness efforts to public audiences, and the extended reach of Agriculture in the Classroom Saskatchewan programs and resources to the province’s teachers and students. She is now the Ministry’s Manager of Livestock Development and works with internal and external stakeholders to support the sustainable growth of the province’s livestock sector. Critical to that growth is public trust. Shelley is a graduate of the University of Saskatchewan, College of Agriculture, and grew up on a ranch near Crane Valley. She is also an active community volunteer and was recognized as Moose Jaw’s Citizen of the Year and awarded a Canada 150 Medal for her efforts. Trish started working in this wonderful agricultural community in 1996 after obtaining an MSc in soil science from the University of Saskatchewan. She started her career as an agronomist with Westco Fertilizers and Agricore United, and then with Monsanto both as a DEKALB field agronomist and an area sales manager. She joined Federated Co-operatives in 2015 as the Knowledge and Innovation Manager, leading training and innovation projects in agronomy. Trish and her husband have three awesome kids, boys ages 13 and 10 (and 10 again! ), and they’re involved in the farm at Melfort, Saskatchewan. Aside from family and work, Trish also loves to run, cycle, and play soccer. Founded 1993, AgriBiz Communications serves the management, marketing and communication needs of agricultural and food organizations with a local, provincial and national reach. The success of AgriBiz is grounded in Adele’s leadership skills and natural diplomacy, her focus on collaboration, and an innate ability to problem solve. She has exceptional insight into board governance through her experience as a manager and senior executive, as well as serving on several boards including an executive member of Canadian Western Agribition and serving as President of Saskatoon Prairieland Park Corporation, SaskTel Centre and Agriculture in the Classroom (Sk) Inc.
Adele is a passionate foodie and farm girl based in Saskatoon. She was raised on a mixed grain/beef operation east of Saskatoon and resided in that area until 2009. Today, Adele lives and works in Saskatoon while maintaining involvement in the family farm. Her daily life combines elements of urban and rural Saskatchewan. Jean Harrington and her husband John crop 7,400 acres as part of a family farm operation in the Glenside area. Marketing crops on the family farm turned into a business for her in 2001 when she founded Prairie Farm Brokerage, an ag marketing and consulting company. Jean joined the Sask Pulse Growers Board of Directors in 2014, and currently chairs their Research and Development Committee. She also serves on the Canadian Grain Commission Western Standards Committee. Janice Tranberg, President and CEO of the Alberta and National Cattle Feeders’ Associations, advocates for cattle feeders on a broad range of policies and economic issues impacting the competitiveness of beef production in Alberta and Canada. Previously Janice was the Executive Director of SaskCanola, Assistant Deputy Minister of Regulatory and Innovation for the Saskatchewan Ministry of Agriculture, vice president Western Canada for CropLife Canada, and Communications and Regulatory Affairs Director with Ag-West Bio. Janice started her career as a research scientist with Performance Plants Inc.
Janice holds a diploma in horticulture from Olds College, and a Bachelor’s of Science and Masters of Science from the University of Saskatchewan. Joan Heath and her husband, Corey Loessin have operated Aidra Farms near Radisson, SK since 1991, where they farm 3000 acres. Joan attended the University of Manitoba, graduating with a Bachelor of Home Economics degree, majoring in Foods and Nutrition. Joan is the past Chair and past Vice Chair of SaskCanola, serving 7 years as a Director. She also was a Director on the Board of Agriculture in the Classroom Saskatchewan for nearly a decade. In 2013, she served on the Interim Board of the Saskatchewan Wheat Development Commission. From 2015 until presently, she is a Director of Cereals Canada. She is a 2018 nominee for induction into the Saskatchewan Agricultural Hall of Fame. From 1990-2007 she worked in the canola industry. In addition, she served two terms as a school board trustee on the Prairie Spirit School Board of Education. Kristine Brown is a Partner with MNP’s Agriculture Services team in Saskatoon. Kristine works with the owners of cattle and grain operations as well as with small businesses in other industries in the Saskatoon and Kindersley regions. She delivers innovative business solutions to help clients overcome challenges, mitigate issues and increase success. In 2009, Kristine received a Bachelor of Commerce degree from the University of Saskatchewan and became a Chartered Professional Accountant in 2012. Penny is truly passionate about agriculture in this province, and her roots are deep – being a farm girl herself. She is no longer active in the family farm but is proud to be a public servant and dedicated to her hard-working team that is helping build a vibrant crop sector in the province. Penny is currently the Executive Director of the Crops and Irrigation Branch, and this is her fourth position within her 19 year tenure with the Saskatchewan Ministry of Agriculture. Penny would be happy to work with you on finding your voice and using your passions to serve your purpose in whatever work you do. year career of working as a Territory Manager/ Business Representative with Cyanamid/BASF. Lakeridge School, sat on the Council of the SIA, as well as several other volunteer organization. helping farmers understand the ever changing technologies to grow the best crops possible.